This quote from Lee Brinley (our U.S. rep), the enthusiastic and committed face of ADEPT in the USA, who really pulled out all the stops in making Oshkosh 2017 the huge success it was, reflects the excitement that our entire team felt during and after Airventure. Position slots were reserved for Lancair Legacy’s, IV/IVP’s, ESP’s and RV-10’s as well as a range of other aircraft types, with over 50 firm enquiries at Oshkosh and a further half dozen in the week following Airventure. If you wish to reserve a position slot, please contact us as soon as possible, as near term slots are filling up fast. Due to a rigorous endurance-testing schedule in 2016 and the beginning of 2017, and related effort bringing our 170,000 sq. ft. manufacturing facility on line, ADEPT did not display at Airventure 2016. For 2017, it was our sole intent to get the message out that ADEPT is accepting position deposits for build slots for production and delivery beginning in Q3 2017. Our new production facilities will now incorporate our engine casting; CNC machining and engine assembly in-house, ensuring that our stringent quality and manufacturing standards are upheld. Most importantly, we thank all those who took the time to visit with us at our display. A very big thank you to Doug and Laurie Osterberg for the use of their Lancair IVP during the show. Also to Troy Masson and Mark and Mike Patey who allowed us to display their aircraft (a record holding Lancair Legacy and very cool tug “Best Tugs” at our booth). Further to Jon and Kathy Hults (who have an engine on order) for their time spent at our booth talking to prospective and existing customers. Interest in our engines from aviators who regularly participate in air racing events was overwhelming – please keep watching our website for updates on this exciting development. To those on our mailing list, we will be communicating with you on a regular basis, and if you would like to be included in the list and receive regular updates please drop us an email. 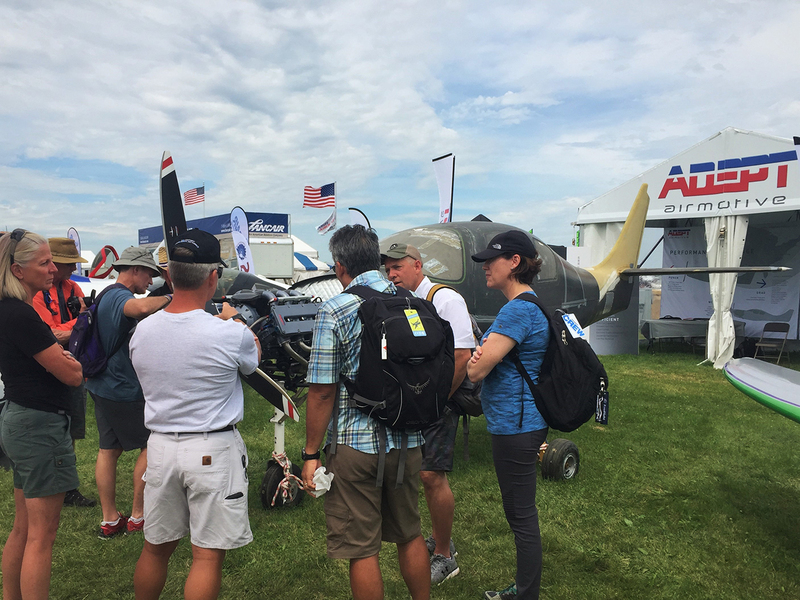 On behalf of the AEPT team, we would like to sincerely thank Lee and Angie Brinley, as well as our loyal friends, supporters and existing and potential customers for the really great feedback and enthusiasm that we experienced at Airventure 2017. A big thank you to Neil Bowden and team for his famous (notorious?…) South African campsite accommodation (which won the 2017 Best Campsite Award), and we need to also give kudos to our good campsite neighbours, the EAA Chapter from Buffalo, who courtesy of John and Carol have the best cuisine in any campsite, for another fantastic Oshkosh experience. Amongst other good memories we must mention our USA friend Jim Kersting, and his faithful pooch Ruby, for his support of ADEPT and clever “mobile” sofa – American hospitality at its best. And finally to the South African based ADEPT team, thank you for your efforts in making 2017 the best Oshkosh to date. Blue skies and safe flying.